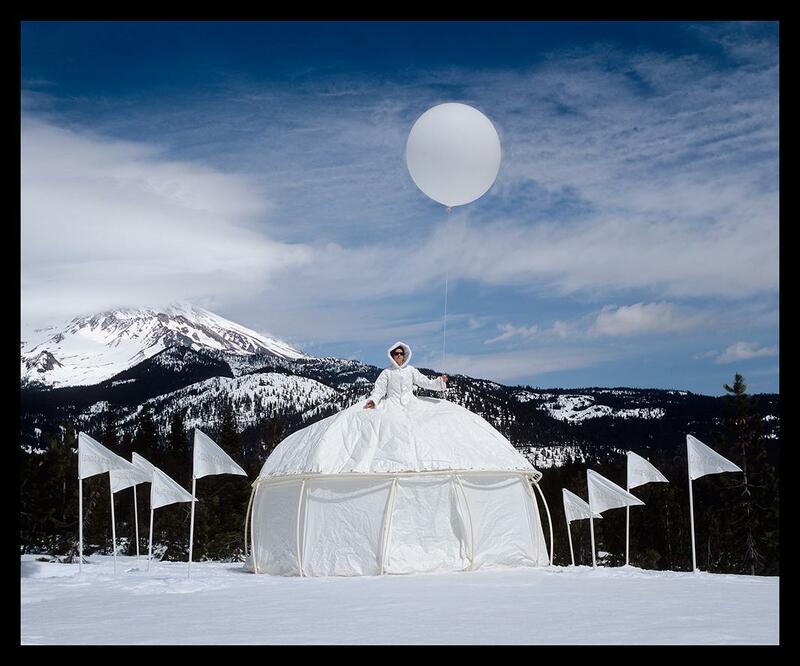 The idea to make a dress tent came to Robin Lasser and Adrienne Pao in a sudden burst of inspiration. 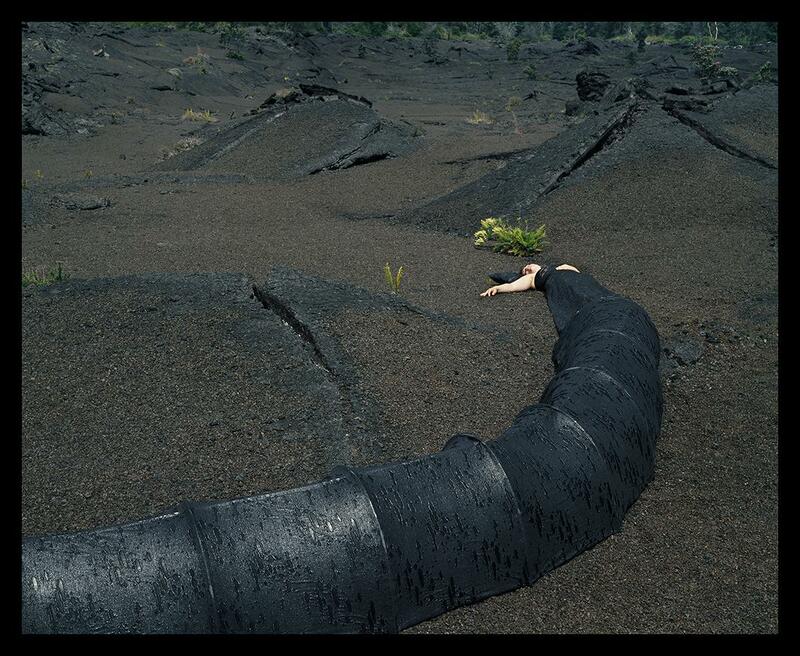 “Robin and I just kind of came up with this idea of what it would be like to have a woman be completely self-sufficient, where she can carry her home on her back and travel anywhere in the world—kind of like a snail in a way,” said Pao, associate director of the graduate photography program at Academy of Art University in San Francisco. The duo met at San Jose State University when Pao was a graduate student and Lasser, a professor of art, was her photography graduate seminar instructor. When they came up with the dress tent concept in 2004, they figured they’d make just one and move on. More than a decade later, they’ve made about 20 and still have ideas for more they’d like to create. “Anything we’re thinking about or feeling, we can use these forms to express those things. It’s almost like a canvas. At least for me, I think that’s why I love this series,” Lasser said. 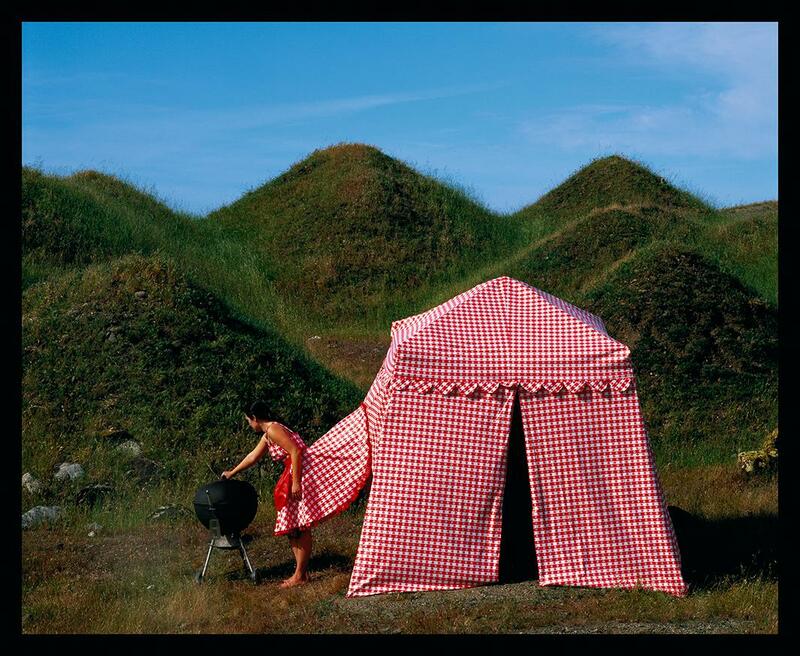 Picnic Dress Tent, Highway 5 near Tracy, California, 2005. Though both women had some experience making artistic structures before, neither knew how to sew, so for their first piece, the Missionary Muumuu Dress Tent, they hired sewers with backgrounds in theater to help them realize their vision. Today, they collaborate with a variety of artisans to make their eclectic ideas come to life. The dresses are initially built to be photographed with women, often sitting on ladders or discreet scaffolding, inside them. But viewers who visit them in person can also experience their interactive and increasingly elaborate interiors. 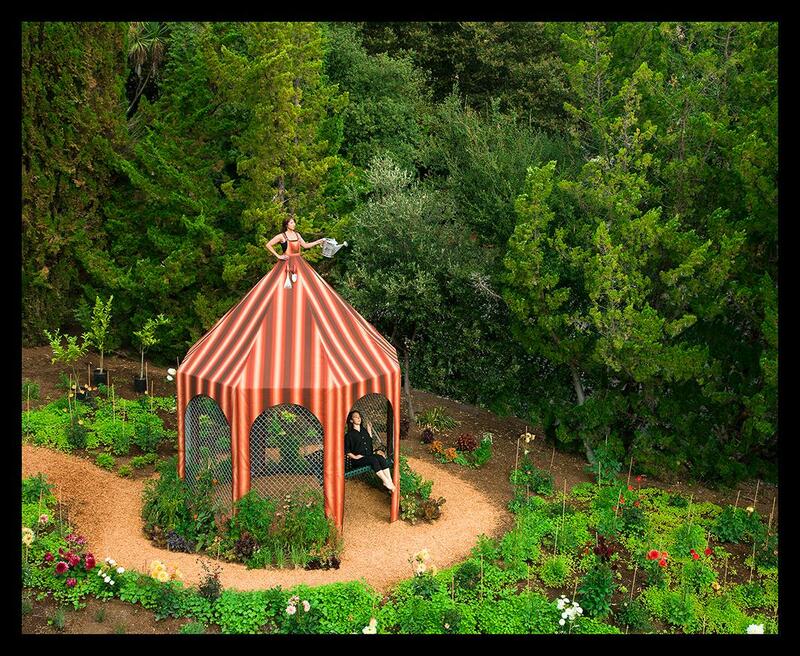 The Edible Garden Dress Tent, an installation at the Montalvo Arts Center in Saratoga, California, was built out of steel and included a swing and garden inside. 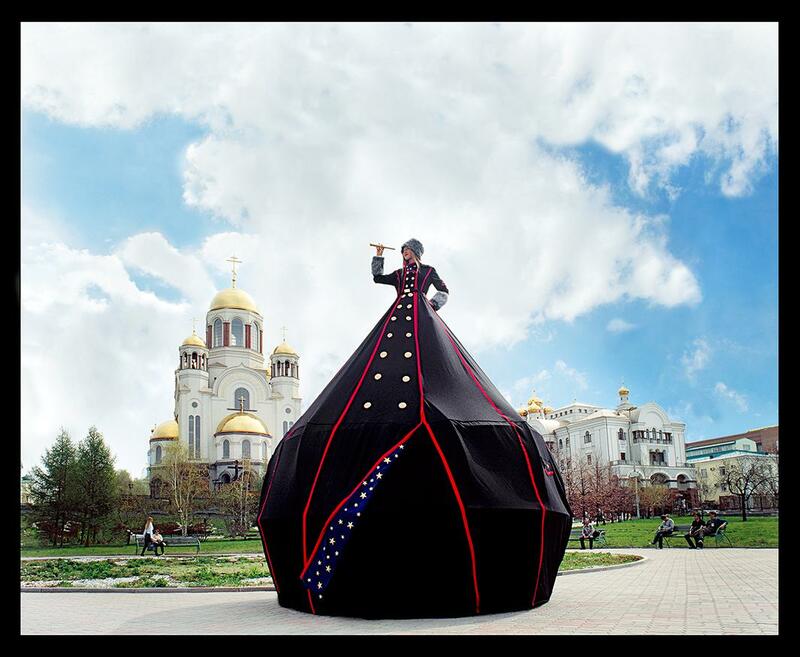 Another, displayed in Yekaterinburg, Russia, functions as a camera obscura. Others have included sound and video components. The dresses are fun and fantastical, but they are also meant to address important issues of identity and politics. One dress that mimics the fashion of a 1950s housewife questions gender roles and expectations. 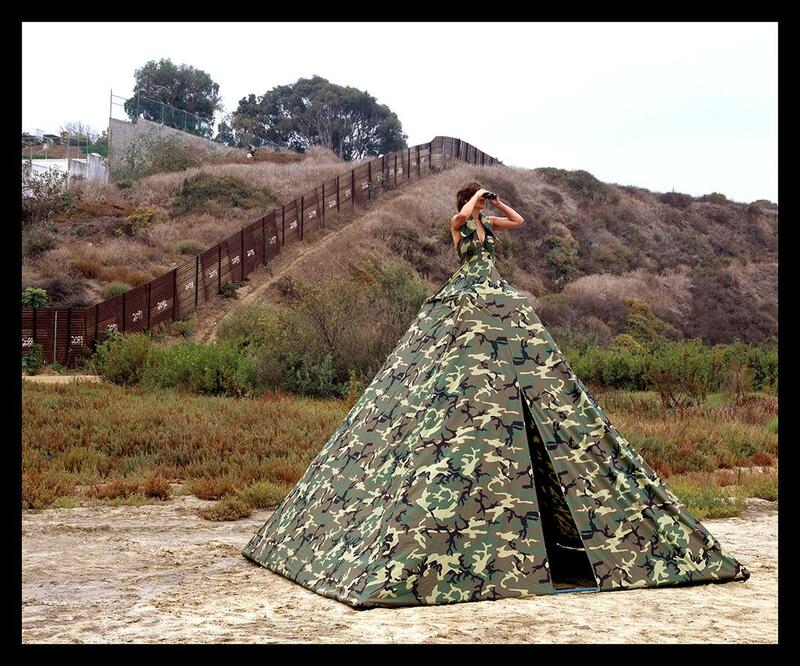 A piece titled Miss Homeland Security, installed on the border between Mexico and the United States, sparks conversations about immigration and nationhood. 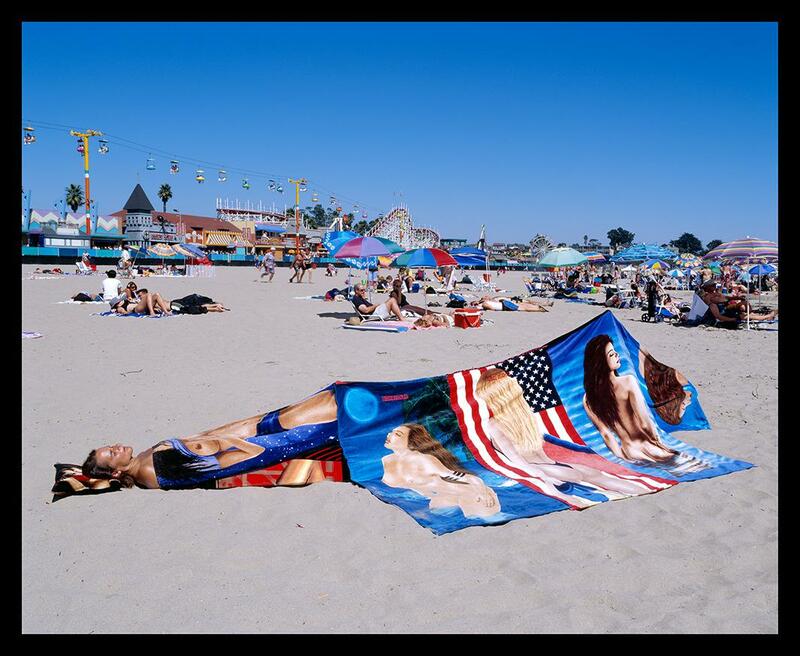 “We want to take these ideas of female politics, land politics, and female iconography that have been embedded in our cultural history and play with them. We want to take these ideas and talk about them, but make them funny and open and invite people in. Sometimes that’s an easier way to discuss something that might be challenging,” Pao said. 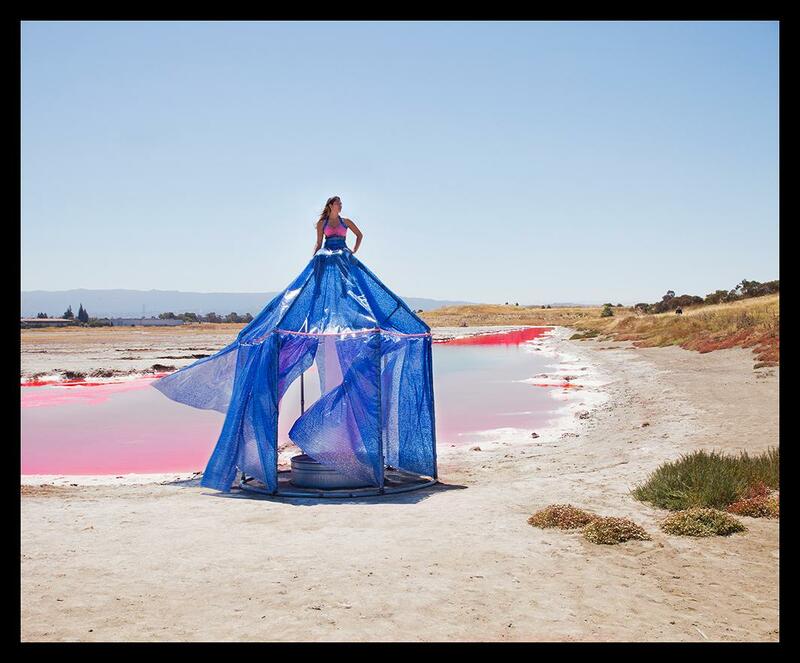 Dresses and photographs from the “Dress Tents” series are on display at the Center for Photographic Art in California until Sept. 11.